Grasscloth is unlike any other wall covering. 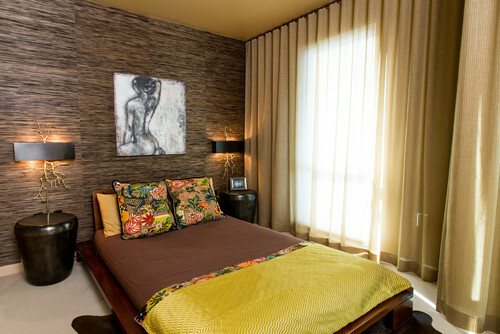 With its unique texture and array of colors and patterns, this natural paper can transform any space, including a bedroom. The look of grasscloth is classic, timeless, and elegant. Most often made from hemp, jute, reed, or arrowroot and adhered to backing, you’ll find that most have a horizontal linear pattern, while others go in both directions. Seams are common and nearly impossible to disguise, so they usually become an important element in the design. Used in modern spaces and traditional homes, grasscloth happens to be lovely in a bedroom, and can add texture and interest to an otherwise lifeless room. Here are four bedrooms I love with grasscloth. I adore the mix of muted blues and bright accents in this room. 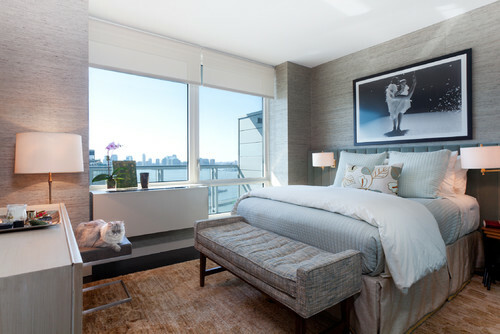 Grasscloth creates a wonderful background for the custom tufted bed and scalloped shams. 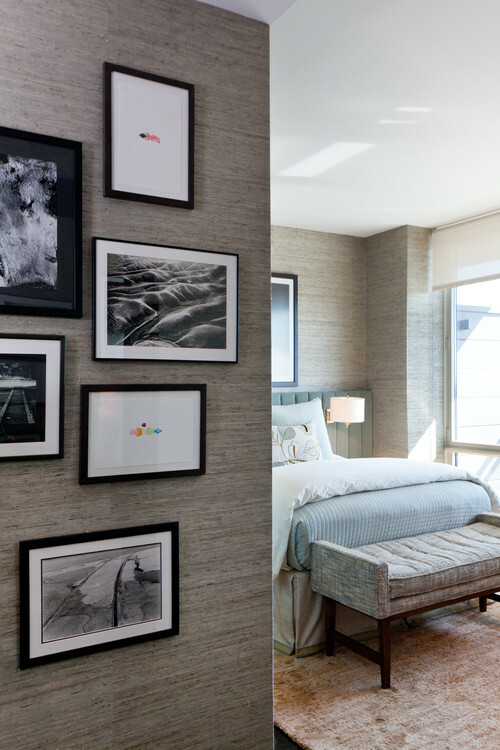 Gray looks sophisticated on the walls of this Chelsea bedroom designed by New York’s Drew McGukin. Powder blue on the bed marries nicely while the black and white photographs keep the room feeling restful. This grasscloth is from Phillip Jeffries. What an interesting texture combination with grasscloth on the walls and velvet on the headboard. This room feels luxurious. 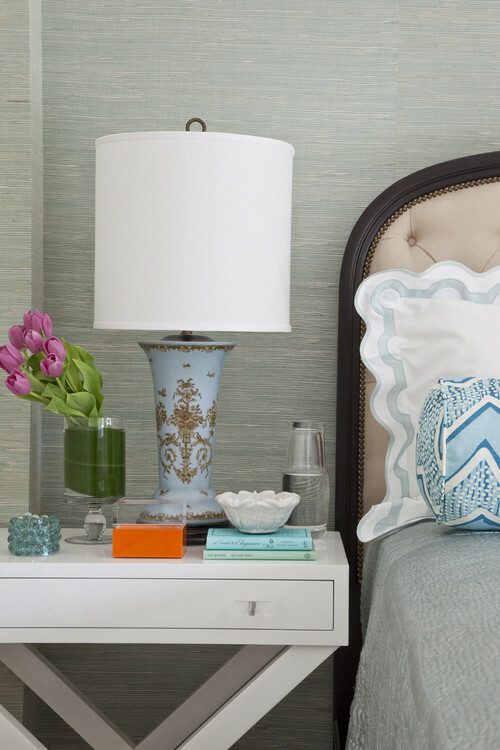 The dotted pillows add a touch of whimsy, and the neutrals introduce calmness into the space. The low platform bed, botanical print, gold accents and wall covering create an Asian-inspired theme in this bachelor bedroom. Although I’m not usually fond of dark wall colors in a sleep space, the light/dark texture works and contrasts with the creamy yellow curtains and light flooring in this San Francisco home. My sweet little German cousin Nina recently visited us with her charming boyfriend, Michael. Two weeks after their departure, I received a large, intriguing envelope postmarked Munich. Inside I found Grandma’s German Cookbook by Birgit Hamm and Linn Schmidt, which contains an extensive and authentic array of traditional recipes. Nina and Michael had also annotated, peppering the pages with bits of information, advice, and favorites. 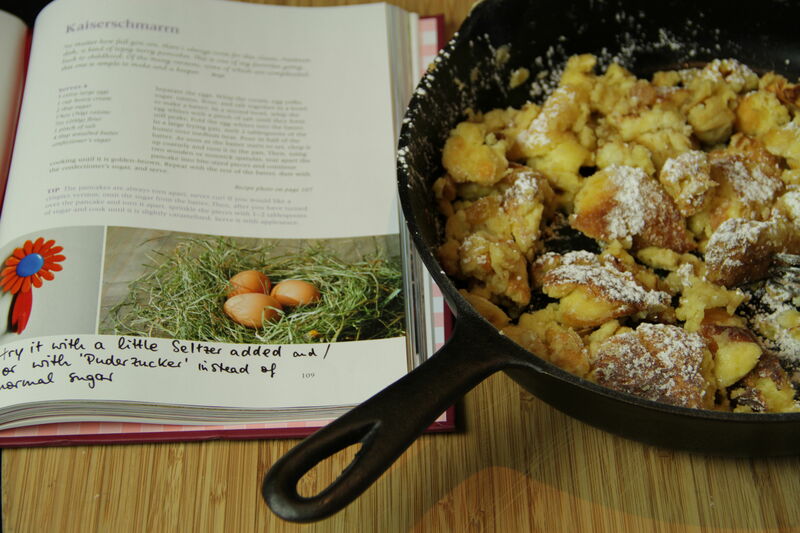 Smack in the center of the book was Kaiserschmarrn – a much beloved Austrian and Bavarian indulgence, and one which I had not considered in quite some time. Etymology for this butter-crisped, shredded pancake is interesting. Kaiser for emperor, and schmarrn for a word which means mishmash, or mess. Stories abound regarding how this dish came into being, but I prefer to think of it as a happy accident – a crêpe gone awry, miraculously rescued by an innovative (or desperate!) chef and transformed into a delicacy fit for a king. 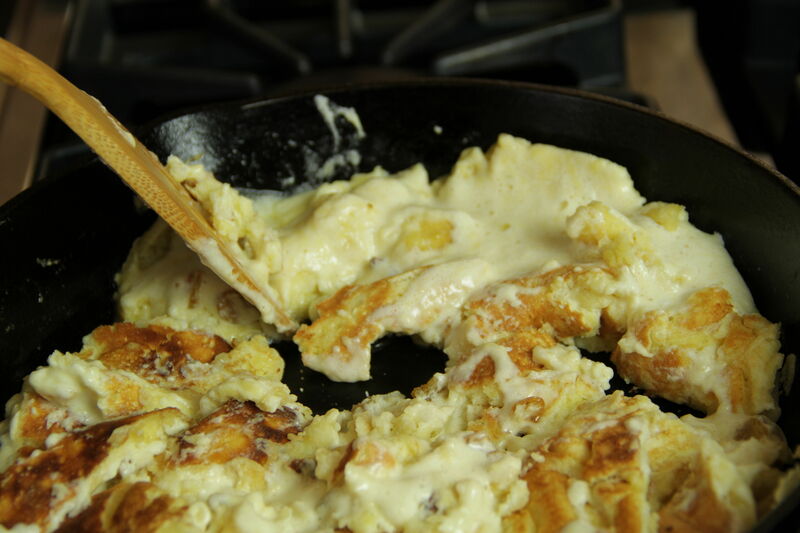 Crisp, beaten egg whites aerate the batter and keep the Kaiserschmarrn light. Use a gentle hand folding them into the somewhat thick batter to retain the airiness. There are many variations to this delectable recipe – replace cream with milk for a thinner result, or add extra sugar to the batter for a cake-like feel. Serve with fruit, or sweet sauce; soak the raisins in apple juice instead of rum; or dust the Kaiserschmarrn with sugar and caramelize it under the broiler. 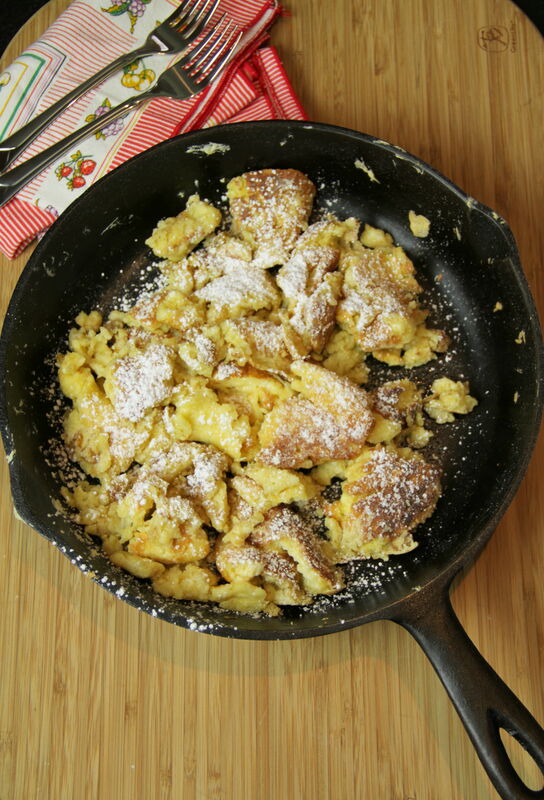 Or, perhaps best of all, dress your crispy Kaiserschmarrn with powdered sugar and eat it straight from the pan for a breakfast in bed that’s fit for a king. 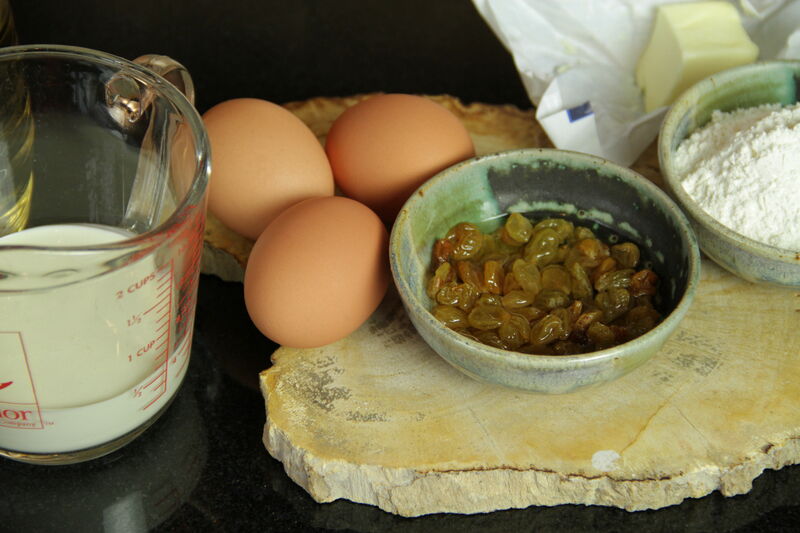 Place golden raisins into a small bowl. Cover with rum and let sit for 15 to 30 minutes. In large bowl, beat egg whites until stiff peaks form. Set aside. In separate bowl, whisk together egg yolks, heavy cream, flour, sugar and salt until thick and smooth. Fold beaten egg whites gently into batter. 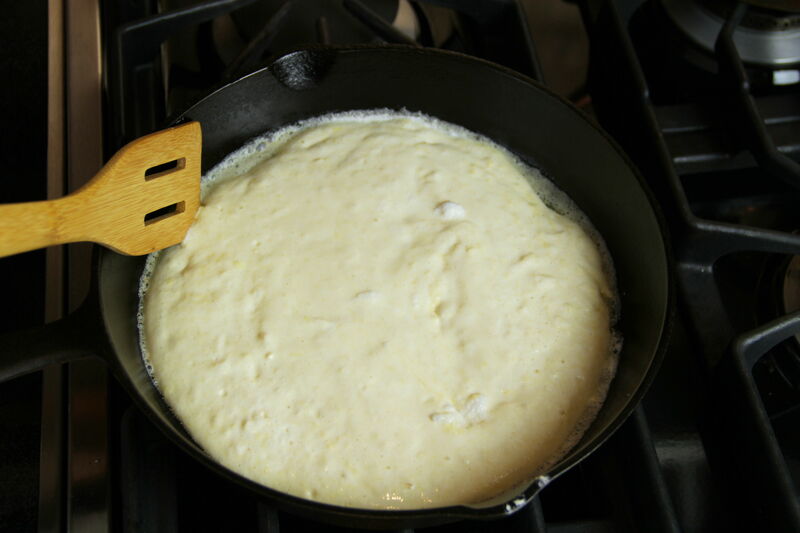 Place a 12–inch diameter heavy frying pan on stove over medium heat. Add butter to pan. When melted, pour in batter to cover. 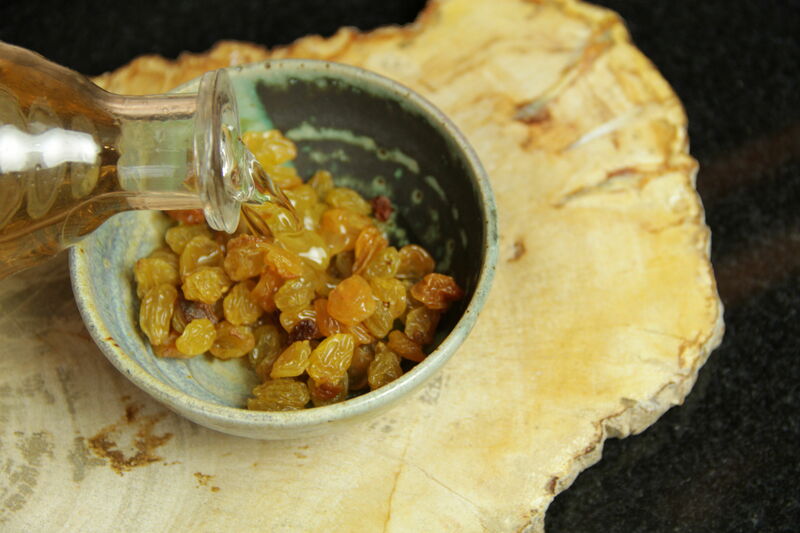 Sprinkle rum-soaked raisins on top. Continue to cook over medium heat. When batter begins to set, gently tear and push apart the dough (using a wooden spatula) into bite-sized pieces. Flip pieces to cook other side. Cook until lightly browned and crisped. Sprinkle with powdered sugar and serve immediately. Makes 1 Kaiserschmarrn; or 2 servings. 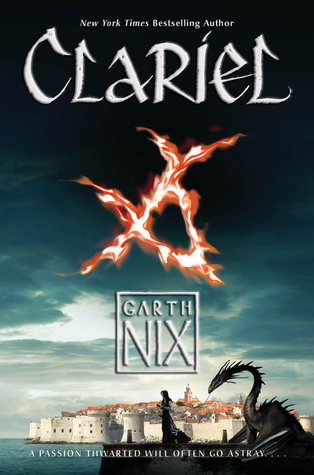 Clariel: the Lost Abhorsen by Garth Nix. If you are a fan of the Old Kingdom Trilogy, you have probably been awaiting this novel with much anticipation and maybe a little bit of fear. After all, new additions to much-loved and long-completed series often promise much and deliver little. If you don’t know what the Old Kingdom it, now is a great time to find out. The original series, written by Australian fantasy/sci-fi author Garth Nix, was started in 1995 with the novel Sabriel. In this novel, and its subsequent two follow-ups, we are introduced to the world of the Old Kingdom, an ancient land of magic, necromancy, and a world still in a semi-Medieval feudal system. Across the Wall to the South, there are cars, phones, conventional weapons. Magic is mostly unheard of. None of this works beyond the Wall, which is why horseback, sword and arrow are still the norm. The kingdom is ordered around the Charter, which is a magical system which keeps order and structure. Think of it like the light side of the Force. There is also a dark side, the Free Magic used by rogue magicians and necromancers. The Abhorsen is the Charter’s answer to Free Magic. Like royalty, it is passed on in the bloodline. When an Abhorsen comes of age, he or she will wear the spelled bells and keep the dead from rising again. Creepy stuff, but important. Clariel is set several hundred years before Sabriel. She is a fierce and fiercely independent young heir to both the Abhorsen and the royal bloodlines who wants nothing more than to live in the woods, protecting the woods and the wilderness. She is the very definition of a reluctant hero, as she and her family move to the capitol city of Belisaire in order to further her mother’s career. This book does not fail to deliver. It never tries to ride on the coattails of the previous books to carry itself and works as the first book in the series, or as a prequel to read after. Great fantasy for adults or middle-school aged kids and up. Do you decorate your bedroom for Christmas? I tend to add a few small embellishments to my bedroom because I like my whole apartment to feel seasonal and in the spirit. During this most wonderful time of the year when all things seem merrier and brighter, why not try introducing holiday décor into your bedroom? There are plenty of decorating opportunities even in the tiniest quarters, and a little bit of red and green, silver, or gold will go a long way. Let these four festive spaces inspire you to decorate your bedroom this holiday season. A suite with seasonal pillows, evergreen wreaths, and poinsettias in the master bath would put anyone in the mood for Christmas. The year-round sage green wall color and ruby red lampshade only add to the holiday feel. Touches might be subtle in this all-white bedroom, but by the looks of things, Santa is on his way. 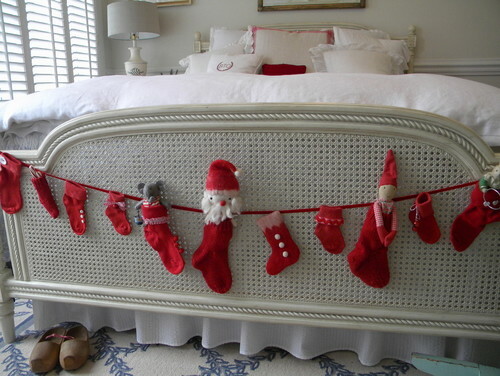 A simple strand with red stockings in different shapes and sizes hangs from the footboard, while a small red accent pillow enlivens this otherwise neutral room and readies the space for December 25. If you’re lucky enough to have a fireplace in your bedroom, the mantle is the ideal place to start your holiday decorating. I like the combination of grapevine garland, red and silver balls, and greenery here. 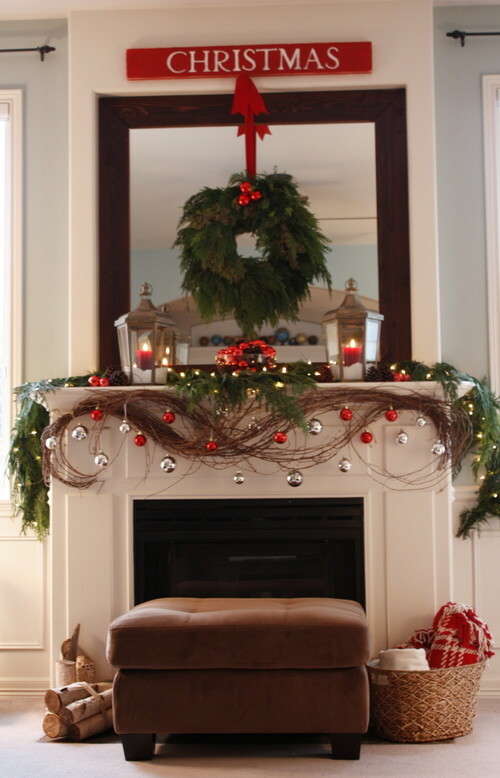 The wreath, white lights, and candles finish off this fireplace nicely. Oh, how I want this room to be mine. 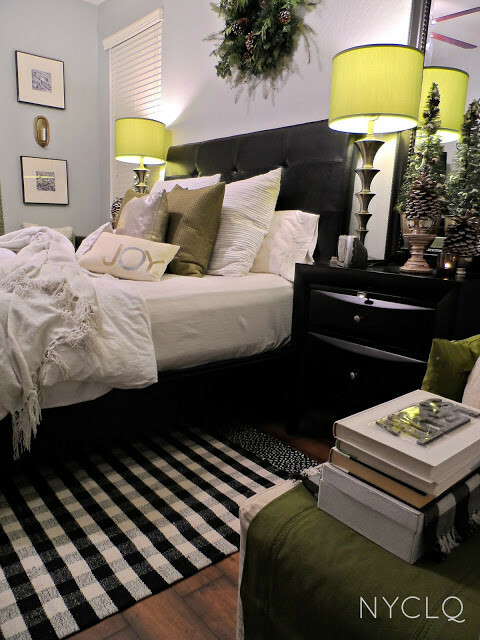 I adore the chartreuse lampshades, the green accents, and the mostly black and white color scheme. The pinecones and evergreens look like they belong all year long. A modest “joy” accent pillow is all this bed needs to welcome Christmas. Before we let go of autumn and plunge into winter’s chilly arms, why don’t we briefly revisit the harvest with some old-fashioned, homey Pumpkin Butter? A jar of this sweet spread is a time capsule that will bring you back to days past as you enjoy its cozy, pumpkin pie flavors. Make your own flavorful purée by roasting or steaming fresh pumpkins, or use a pre-packaged can for a quick, easy delight. It’s “butter” only in the sense that it is spreadable. 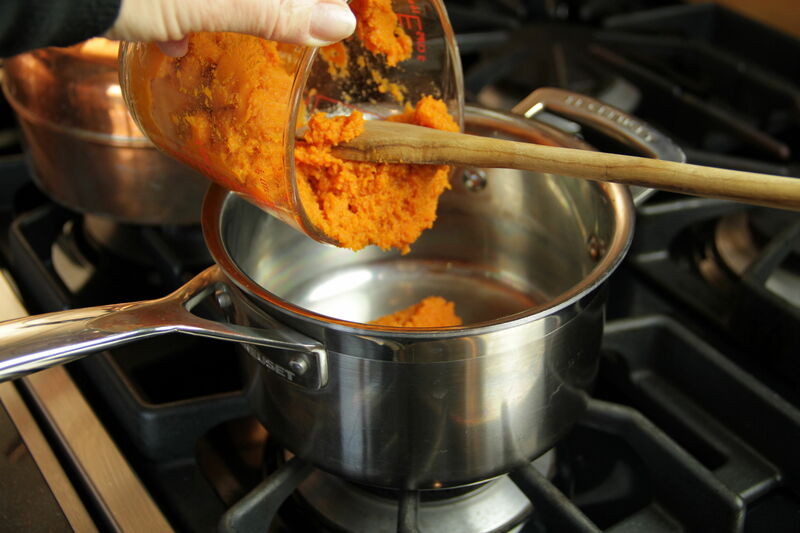 Pumpkin purée, brown sugar and pie spices thicken up and colors darken as they cook into a “shmearable” substance, just right for a slice of hearty toasted bread. 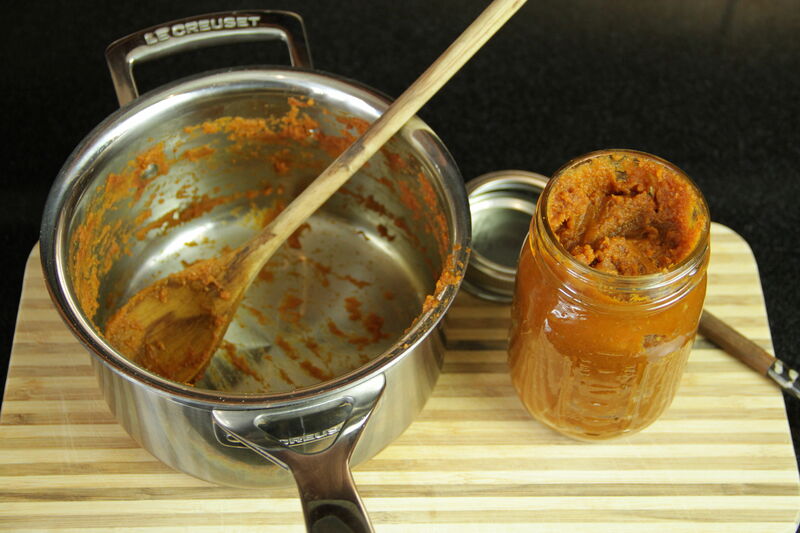 Or, try a spoonful of Pumpkin Butter stirred into some hot oatmeal for a delicious diversion. You may also like it scooped on top of some freshly baked waffles, or even mixed into a dish of plain yogurt. 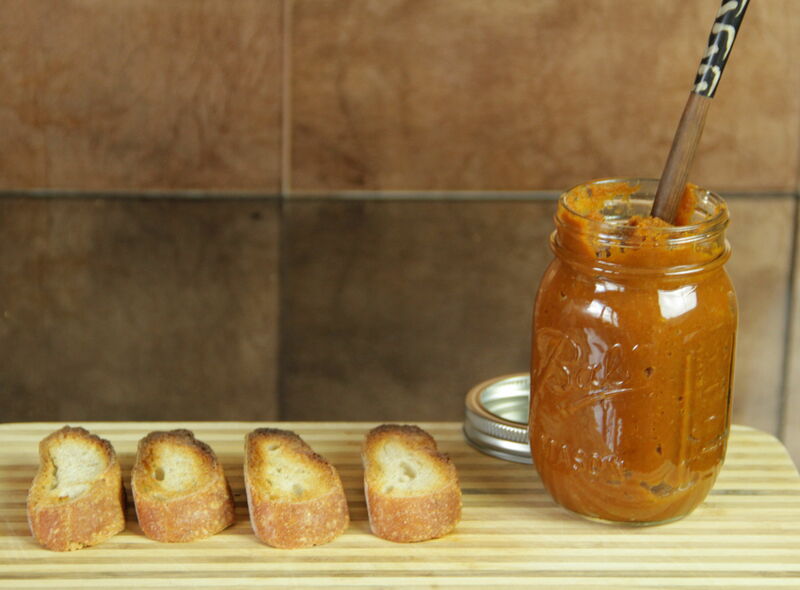 Packed neatly into a glass mason jar, pumpkin butter makes a lovely gift as well. 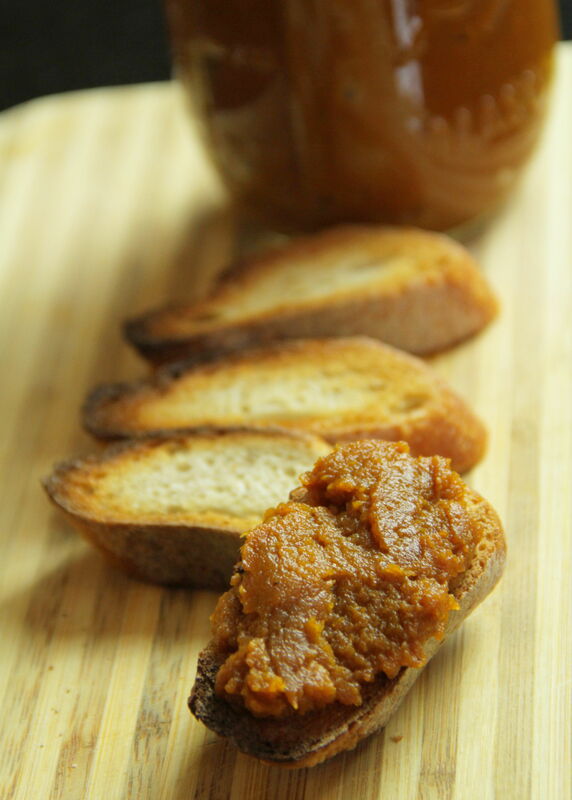 Years ago, many families prepared and canned their own pumpkin butter. In recent years, however, the USDA warns against canning pumpkin (and other squash varieties) due to the low acid content of the vegetable. While some people still preserve pumpkin butter, adding lemon juice or vinegar to raise the acidity levels, I think it best we follow the guidance of the USDA and simply eat it immediately – spread, scooped or stirred – for an old-fashioned, homey breakfast in bed. 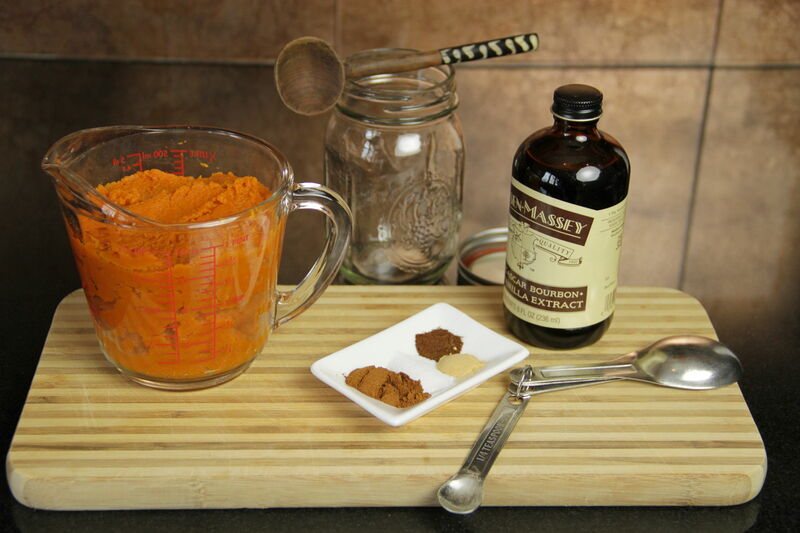 Combine pumpkin purée, brown sugar, salt, cinnamon, ginger, cloves and vanilla in small heavy saucepan. Bring to a slow simmer over medium heat. Reduce heat to low, then cook until thickened and flavors are melded, stirring occasionally, about 20 to 25 minutes. Cool, and place in jar. Use immediately, freeze, or refrigerate and use within one week.